United Way of Wells County received a “GEM Award” from the Indiana Association of United Ways at the 2017 United Way and Funds 19th Annual Golden Excellence in Media (GEM) Contest held April 13, 2017, at the Indianapolis Marriott North. There were 83 entries from 24 United Ways/Funds in three divisions. Entries were judged on innovation, accomplishment of purpose, production quality, and measurable success. United Way of Wells County received the GEM Award for the Blossom and the BISONtennial book. This book was written by Pamela Beckford and illustrated by Pam Gregory. Blossom distributed the book to various preschool and kindergarten children when she went into the classrooms to read it to them in celebration of the Indiana Bicentennial. 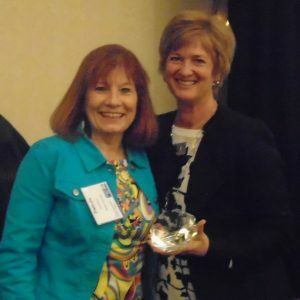 Photo: Maureen Noe, President and CEO, Indiana Association of United Ways presents the award to Pamela Beckford, Executive Director, United Way of Wells County.